The Advanced Dementia Practice Model provides the response to this most complex phase of dementia. When a person requires the Advanced Dementia Practice Model there will be a range of people already involved in their care and support – this is the 8 Pillars Team. They will be coordinated by the Dementia Practice Coordinator and determined by the person’s experience of dementia and underlying health. For younger people with dementia there may be continued involvement from the neurology team. People with learning disabilities are likely to continue to be supported by specialist LD services. There should also be close links between the Dementia Practice Coordinator and medical disciplines related to the person’s co-morbid conditions. The decision to refer the person for assessment by the Advanced Dementia Specialist Team will be initiated by the Dementia Practice Coordinator. This will follow from discussion and agreement between the Dementia Practice Coordinator and the 8 Pillars Team. 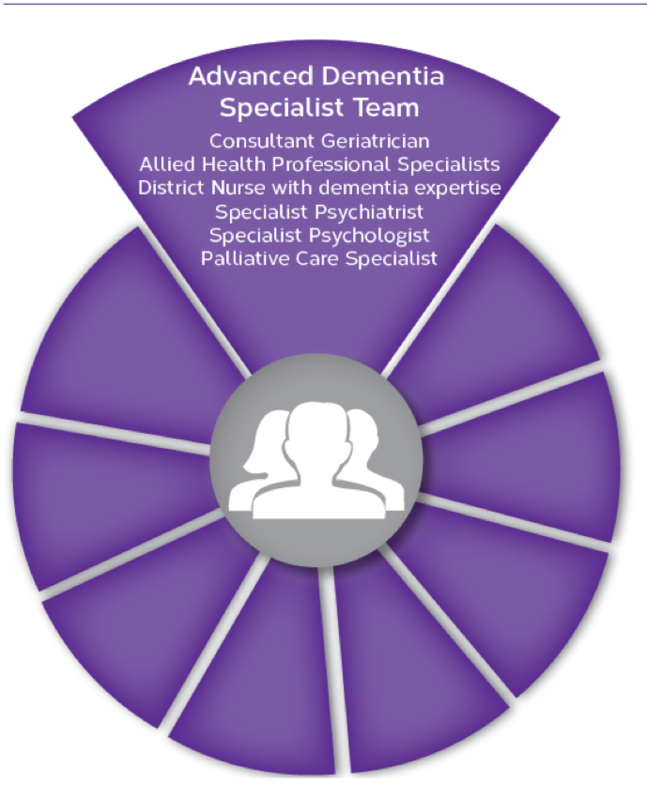 The entry point to the Advanced Dementia Practice Model is determined by the level of complexity of need requiring substantive health care as assessed by the Advanced Dementia Specialist Team. The range of factors necessitating this approach will be specific to each individual but likely to be determined by the progressed physical experience of dementia and inter-play of co-morbid illness. Access to this approach is based on the principle of equality and determined by need as opposed to prognosis. Once the person has been assessed as requiring the Advanced Dementia Practice Model the Advanced Dementia Specialist Team will review their current care and identify gaps. A care plan will be created outlining the responses to the person’s physical, psychological and social care needs. The diagram opposite outlines the operation of the Advanced Dementia Practice Model. The care plan will build a strategy to support the person through advanced dementia and end of life. It will identify the practitioners required to support the person’s care — bringing in specialist support where this is not already being provided by the 8 Pillars Team. 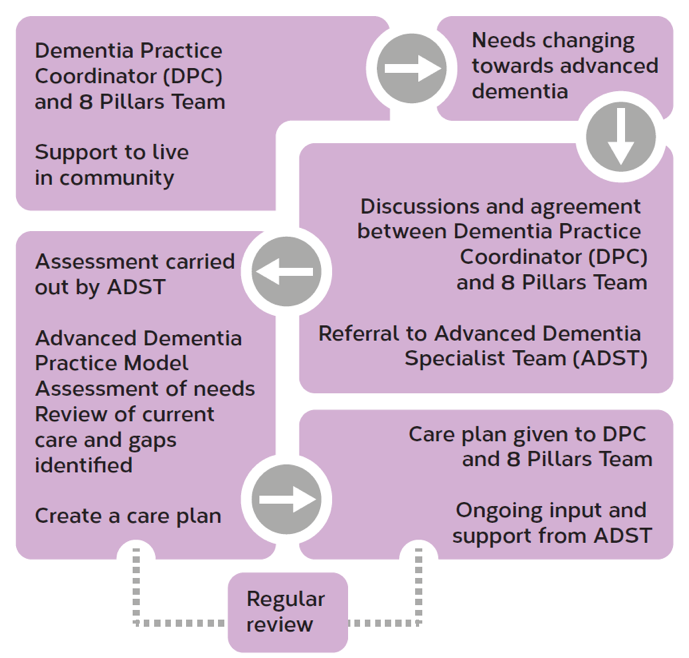 The Advanced Dementia Specialist Team will enhance the support provided by the 8 Pillars Team and provide advice through the Dementia Practice Coordinator. The care plan will be held by the Dementia Practice Coordinator and 8 Pillars Team. Crucially, there will be regular review of the care plan and ongoing input from the Advanced Dementia Specialist Team. People may experience the advanced dementia phase for months or years. The intensity of health care input required is likely to fluctuate along with the level of involvement from the Dementia Practice Coordinator. The input from the Dementia Practice Coordinator and the Advanced Dementia Specialist Team may be less intensive for periods if the person has relatively stable needs and support is in place to meet these. Whilst the entry point to this Model is determined by the level and complexity of health care needs, responding to the social and emotional experience of advanced illness and end of life is of equal importance.